ChiIL Mama : EXTENDED: Cirque du Soleil's TORUK Adds One Show Due To Popular Demand Friday, August 5 at 3:30 p.m.
EXTENDED: Cirque du Soleil's TORUK Adds One Show Due To Popular Demand Friday, August 5 at 3:30 p.m.
Due to popular demand, Cirque du Soleil is thrilled to announce one additional performance of the upcoming touring show inspired by James Cameron’s record-breaking movie AVATAR, TORUK – The First Flight, on Friday, August 5 at 3:30 p.m. This show is in addition to the previously announced performances on August 3-7 at the United Center. The show is presented by Visa Signature® in association with United MileagePlus®. 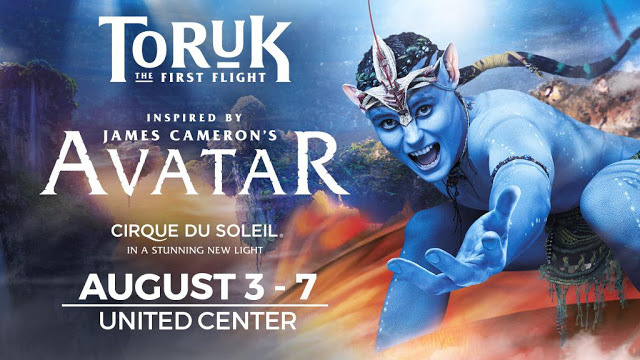 Tickets for this performance go on sale on Friday, July 29 at 3:00 p.m. CST and can be purchased at https://www.cirquedusoleil.com/toruk. Inspired by James Cameron’s AVATAR, TORUK – The First Flight transports you to the world of Pandora in a visually stunning live setting. Experience a storytelling odyssey through a new world of imagination, discovery, and possibility. Through a riveting fusion of cutting-edge visuals, puppetry and stagecraft buoyed by a soaring cinematic score, Cirque du Soleil applies its unique signature style to James Cameron’s imaginary world and “makes the bond” between two kindred artistic visions that capture the imagination. This live immersive experience also bears the distinct signature of directors and multimedia innovators Michel Lemieux and Victor Pilon. It is a living ode to the Na’vi’s symbiotic coexistence with nature and their belief in the basic interconnectedness of all living things. Narrated by a “Na’vi Storyteller” and populated by unforgettable characters, TORUK – The First Flight is a mythical tale set thousands of years before the events depicted in the film AVATAR, and before any humans ever set foot on Pandora. friend Tsyal, on a quest high up in the Floating Mountains to find the mighty red and orange predator that rules the Pandoran sky. Prophecy is fulfilled when a pure soul rises among the clans to ride Toruk for the first time and save the Na’vi from a terrible fate. TORUK – The First Flight in Chicago is proud to be presented by Visa Signature®, in association with United MileagePlus®. DHL is the official sponsor. The show is being created through a licensing arrangement with 20th Century Fox. 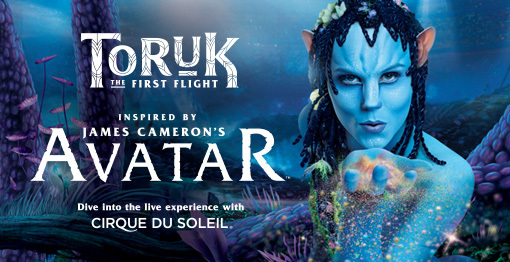 TORUK – The First Flight is Cirque du Soleil’s 37th production since 1984. The company has brought wonder and delight to more than 155 million spectators in more than 300 cities on six continents. Cirque du Soleil has close to 4,000 employees, including 1,300 performing artists from close to 50 different countries. For more information about Cirque du Soleil, visit https://www.cirquedusoleil.com. To find out more about the ONE DROP Foundation, visit https://www.onedrop.org. Take the X-Men Home? Yes Please!